Smart, quick fat blasting cardio! 19-Minute Metabolic Cardio Fat Burning Workout! Whether it’s during a specific fitness challenge or just boot camp in general, I am always asked what to do on non-boot camp workout days. Generally, you do not need to do additional resistance/strength training on your off days if you know you will get in at least three boot camp workouts during the week. First of all, traditional, steady state cardio should become a thing of the past. The days of getting on a treadmill or elliptical and going for 45-60 minutes is not a good strategy if burning fat and calories is your goal. Instead use the Tabata protocol of 20 seconds of intense exercise followed by 10 seconds of recovery for eight consecutive rounds. 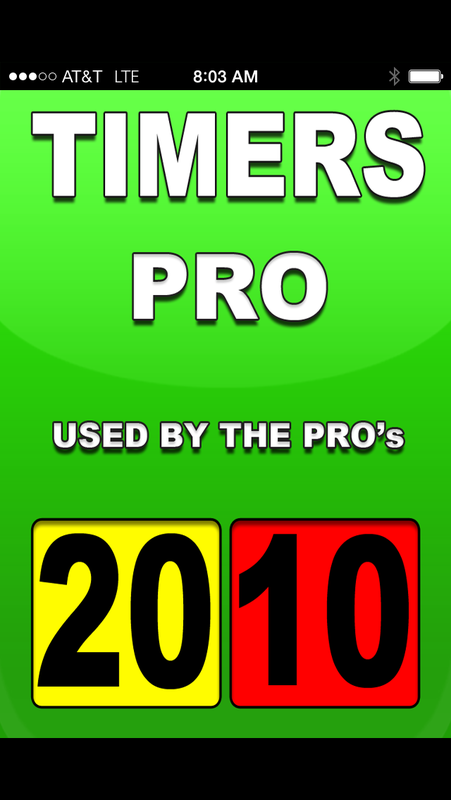 To be able to do this accurately, the first thing I suggest is to get the smart phone app “Timers Pro” which is .99 cents (see image below). Launch the app and choose the “Tabata” screen and make sure it is set to 20 second intervals with a 10 second rest period. This is the default setting so it should be ready, but it is very simple to do. You only need a total of about 15-20 minutes, that’s it. But you must make that 15-20 minutes focused and intense. Each Tabata takes 4 minutes (8 rounds of 20 sec ON and 10 sec OFF = 4 min). Give yourself about 1 minute rest between each 4 min series of 20-10 Tabatas. My personal favorite way to start if I am at a regular gym or health club is on a treadmill. I place my phone on the ledge or in the cup holder space (whatever works for you) and I warm up with some fast paced walking and moderate running for about 5 minutes. You can vary the incline and the speed of the treadmill based upon your fitness and conditoning level, just make sure that once the actual workout starts, it is challenging enough to get your heart rate elevated to about 85% or more of your MHR (max heart rate). Remember, you are only going to be up at that level for fewer than 20 seconds. If you are a beginner, start by only taking your heart rate up to about 55-60% MHR and work your way up as you get into better shape. Set the treadmill to the proper desired speed and incline for your fitness level. Hit the START on the Timers Pro app and jump on the treadmill and begin running/sprinting. When the twenty seconds ends, grab the railing and jump your feet out to the sides of the treadmill to keep the belt moving. CAUTION: When jumping on and off the treadmill, it is extremely important to get a firm, safe grip on the railing or other provided handles. Do not let go of the handles until you have safely established your position and footing again. This should only take a few moments and is a seamless transition, but take your time until you get the hang of it. If desired, change the speed and incline or leave it the same. A treadmill Tabata workout is done in segments of 5 minutes each including the 60 seconds rest. Therefore, you have a choice of doing as few as one or as many as five consecutive series of 20 seconds ON and 10 seconds off for 8 rounds with 60 seconds rest between rounds. Find a space either indoor or outdoor where you can run laps. RESET your Tabata timer and begin again, this time running laps for 20 seconds at a time with a 10 second recovery. Repeat for 8 rounds. Rest one minute and continue for one or more additional rounds of 8. Find a space like a basketball court, tennis court or any open space where you can run at least 20 yards at a time. RESET your Tabata timer and begin again, this time run down to the end of your marked off space, bend over and tap the ground, then run to the opposite end, tap the ground and repeat until the buzzer sounds for the 20 seconds. Walk for 10 seconds, and repeat for 8 rounds. Rest one minute and continue for one or more additional rounds of 8. Warning! Box jumps are an advanced exercise, and do not attempt if you are not at a suitable level. You can substitute high-tempo prisoner squats or full body extensions. If you are doing box jumps, stand in front of your step bench or plyo box. RESET your Tabata timer and begin again, this time by jumping up on the platform and stepping down as many times as possible in 20 seconds. Do NOT jump down backwards between reps, this can result in an achilles tendon injury! Repeat for 8 rounds. Rest one minute and continue for one or more additional rounds of 8. 19-Minute Whole Lotta Tabata Workout! A great way to keep your “cardi-action” Tabata workouts interesting is to one round of 20-10/8x on the treadmill, one round running laps, one round of sprint shuttles, and one round of box jumps. Do each of the following exercises for 20 seconds followed by 10 seconds of recovery for 8 consecutive times, rest for one minute and move on to the next exercise. There ya go, four phases that each take only four minutes plus a one minute rest. That’s a total of only 19 minutes because after the final round (box jumps) you are finished and do not have the one minute of rest.